Thanks to Grizzla Pixelmaid of VWER, we have the full and unadulterated transcript of our meeting (more filling! more taste!) at VWBPE last month. 160+ edu-advatars in attendance. Not a bad showing...I came up with 173 last year. Much of the talk, as one might expect, focused on virtual worlds and games other than Second Life, but there still appears to be robust investment of time and energy in that grid. Some familiar complaints, about lack of support from IT staff, locked-down classroom tech, SL's bad reputation, high cost, and steep learning curve, returned to haunt our talk. Hat tip to Zana Kohime for this remark: "One of the new terms I think fits is Edgerati: people who venture out onto various edges, engage with participants on those edges, develop deep insight from their involvement on the edge and report back to the rest of the world what they have learned." SL may not technologically be "the edge" for those in gaming or VWs, but for education 3D immersive learning, broadly defined, remains edgy. I felt more confident, after this meeting, that we'll soon see more of this technology in classwork. On another positive note, we heard about moves to bring virtual worlds to mobile devices and an interest in collaboration and content-creation by the latest wave of Millennial learners in US classrooms. That is very exciting. I was also pleased to see how many of the attendees were year-one SLers. Say what one might about SL, but it's a good grid for getting 150 or more of us together for a plenary session. Even if we increasingly turn our talk to Minecraft and OpenSim and Unity and Jibe. 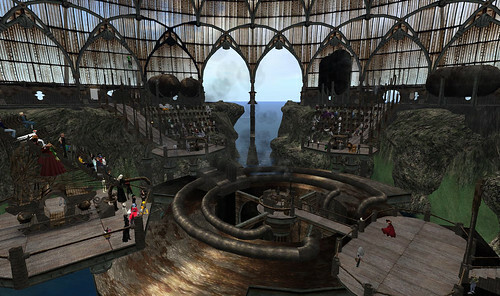 Usher in OpenSim: One Hour, 19 Prims, Staircase!